Detects human c-MET phosphorylated at Y1234/Y1235. Supplied as a lyophilized powder from a 0.2um filtered solution containing PBS, pH 7.4, 5% trehalose. Reconstitute with 250 ul sterile PBS. Lyophilized powder may be stored at -20°C. Reconstitute with sterile buffer. Aliquot and store at -20°C. Reconstituted product is stable for 12 months at -20°C. For maximum recovery of product, centrifuge the original vial after thawing and prior to removing the cap. Further dilutions can be made in assay buffer. Small volumes of anti-MET antibody vial(s) may occasionally become entrapped in the seal of the product vial during shipment and storage. If necessary, briefly centrifuge the vial on a tabletop centrifuge to dislodge any liquid in the container`s cap. Certain products may require to ship with dry ice and additional dry ice fee may apply. Hepatocyte growth factor receptor (HGF R), also known as c-MET, is a receptor tyrosine kinase that consists of an extracellular chain and a longer chain. The chain contains the transmembrane helix and the cytoplasmic portion. Ligand-stimulated phosphorylation of tyrosine 1234 and tyrosine 1235 in HGF R's chain results in stimulation of intrinsic kinase activity. Flow Cytometry: 2.5ug/1x10e6 cells using MCF-7 human breast cancer cell line treated with pervanadate, fixed with paraformaldehyde and permealized with methanol. 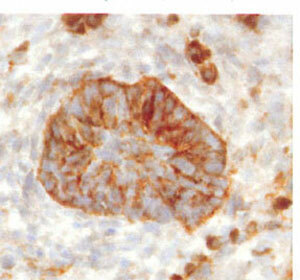 Immunohistochemistry: 5-15ug/ml using immersion fixed, frozen section of mouse embryo. Western Blot: 0.5ug/ml using pervanadate-treated MDA-MB-468 human breast cancer cell line . Flow Cytometry: MCF-7 human breast cancer cell line was unstimulated (light orange open histogram) or treated with 100uM pervanadate for 10 mins. 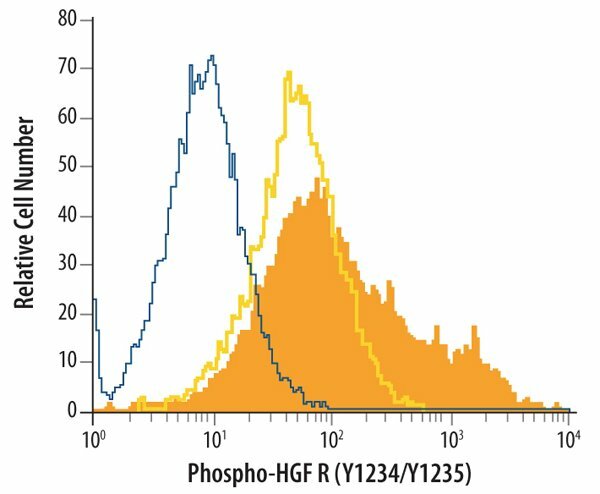 (dark orange filled histogram), then stained with MBS629762 or control antibody (blue open histogram), followed by PE-conjugated anti-rabbit IgG secondary antibody. To facilitate intracellular staining , cells with fixed with paraformaldehyde and permeabilized with methanol. Western blot shows immunoprecipitate of MDA-MB-468 human breast cancer line untreated (-) or treated (+) with 100uM pervanadate for 10 mins.PVDF membrene was probed with 0.5 ug/mL MBS629762,followed by HRP-conjugated anti-rabbit IgG secondary antibody. 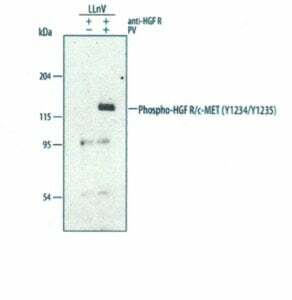 A specific band was detected for phospho HGF R/c Met(Y1234/Y1235) at~145kD. Experiment was conducted under reducing conditions. NCBI/Uniprot data below describe general gene information for MET. It may not necessarily be applicable to this product. Sequence similarities: Belongs to the protein kinase superfamily. Tyr protein kinase family.Contains 3 IPT/TIG domains.Contains 1 protein kinase domain.Contains 1 Sema domain.